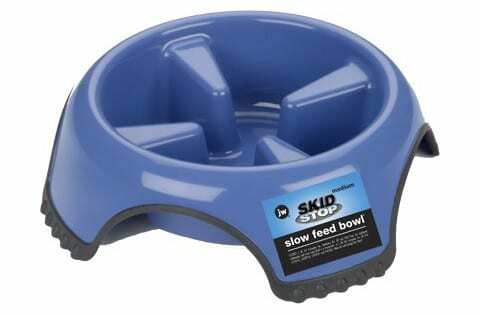 What is a Slow Feed Dog Bowl? Have you noticed that your dog eats way too fast and you're afraid that they'll choke or bloat when they're finished? If so, your dog may benefit from having one of the slow feed dog bowls because this can help slow down their eating time. However, there are hundreds of these types of dog bowls available, and it's very easy to feel overwhelmed or unsure if you've chosen the best one. We've done our research, and we've rounded up the five best slow feed dog food bowls and compiled mini-reviews as well as a buying guide, so you know exactly what to look for when you're shopping for this product. When it comes to slow feed dog bowls, there are several benefits as well as things to consider before you settle on a particular style or brand. This dog bowl style typically contains obstacles at the bottom of the bowl in the form of raised edges, dividers, or protruding pieces that force your dog to slow down while they're eating. These obstacles will push your dog's food around the bowl as they eat, and they'll have to slow down to ensure that they get it all. You can purchase them in several sizes, styles, and designs so it may take a few tries to find the best bowl that works for your dog's eating habits and preferences. They can come made out of metal, plastic, or silicone. Traditionally, stainless steel or metal bowls are seen as a heavier option, but they can also be more stable. Silicone or plastic bowls are more lightweight, and this can make them a good choice if you plan to take it with you when you travel or move it around a lot. 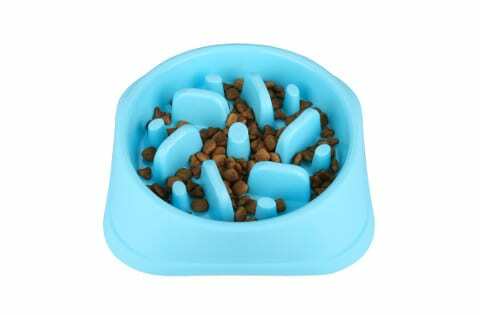 There are several advantages that come with using this type of bowl for your dog's food. Large dog breeds tend to have a bigger problem with choking when they eat quickly, but it can also happen to small and medium-sized dogs as well. The small obstacles make your dog work a little harder to get their food, and they get in the way if your dog tries to take a large mouthful of their food. Because they're forced to slow down and concentrate on eating, there are fewer chances for them to choke while they're eating. It may take them a little while to get used to eating out of this type of bowl, but they'll eventually do fine. If your dog is eating very quickly, they can be swallowing a lot of air with their food, and this can lead to a problem with bloating. In general, bloating can be very uncomfortable for your dog, and it can even verge on painful. Gas is another common problem that comes with your dog eating too fast because indigestion can result from the large amount of food your dog consumes on a faster basis. Your dog's body will work harder to digest the food, and bloating and gas are two common issues as a result of this. You may notice your dog throwing up right after they've eaten, and this is a good sign that they're eating way too fast. 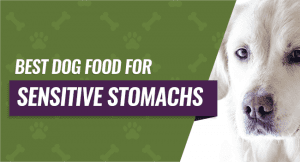 Their bodies are struggling to digest such a large intake of food in a short period of time, and throwing it up is one way to reduce the stress on your dog's digestive system. 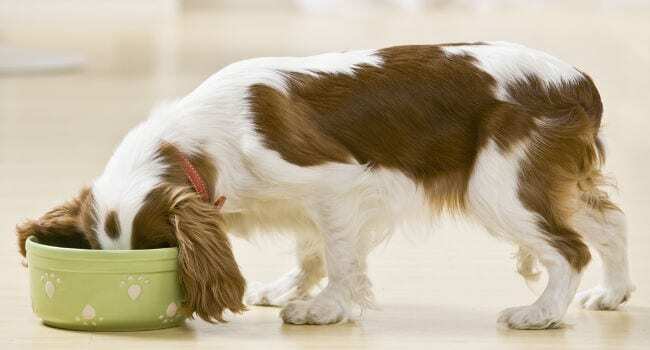 Because your dog isn't able to eat as quickly with these types of bowls, their digestive systems won't have to work as hard to digest the food because it'll come in at a slower pace. This should lead to a reduced amount of vomiting after your dog eats, or it may clear it up completely. When a dog eats quickly, they tend to feel full faster but want to eat again in a few hours because they feel hungry again. This can be very frustrating for anyone who is working on portion control because it can be hard to resist not giving your dog more when they beg. As your dog's eating slows down, they'll start to feel full for a longer period of time. This can help you improve their portion control because they won't come begging for more food, and you can keep track of exactly how much they're eating because they won't be throwing it up. There are a few minor disadvantages associated with using this type of food bowl, and we've outlined them below. Cleaning - Since these bowls have walls and protruding parts, they can be slightly more difficult to clean. You can't rely on tossing them into the dishwasher, and you may have to take a little extra time to ensure that it's completely clean to avoid mold issues. 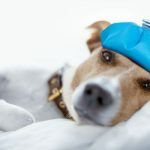 Your Dog Can Outsmart It - Dogs are very good at problem-solving, and if they figure out how to tip the bowl over, you won't get the outcome you're after. This is where a more heavy-duty bowl may come in handy because your dog may have a more difficult time tipping it over. Accidental Ingestion - If your dog likes to chew things, they may accidentally chew and swallow pieces of the plastic or silicone bowls. This can cause stomach upset and larger problems if they can't pass the plastic pieces. Chipping Teeth - Although you can purchase several different sizes, your dog may have a problem getting their snout far enough in the bowl to get to their food. This can lead to them chipping their teeth or completely breaking them as they try to shove farther into the bowl. These types of bowls typically come in three different types of materials, but you'll get the choice of several different styles and designs to choose from. A stainless steel bowl is one of the more popular choices because they're a more heavy-duty choice and they usually feature a more simple design. You'll normally get the bowl with a small dome or pillars set for obstacles, and there will be a rubber ring fitted around the base for added durability and stability. There are no chances of any plastic residue soaking into your dog's food with these bowls, and your dog won't be able to chew pieces off and swallow them like they can with some of the other choices. But, these are also slightly more difficult to carry around due to their heavier build. Silicone is another popular option when it comes to these feeder bowls because silicone doesn't contain chemicals that can get into your dog's food. It's also slightly softer and easier to carry around, which is a bonus if you plan to travel with your dog. Silicone feeder bowls can come with elevated walls, pillars, or protruding parts that make your dog slow down while they eat. You can also purchase a silicone mat type feeding bowl that may be easier for smaller dogs to handle. A plastic feeding bowl is one of the more inexpensive options, and it comes is a variety of shapes, colors, and sizes. You'll find plastic bowls with ridges, elevated walls, pillars, domes, or other obstacles to help slow your dog down when they're eating. A downside of plastic is that your dog could chew parts of it off and swallow them. Plastic can also contain chemicals that can sink into your dog's food, no matter how quickly they clean their bowl. While the traditional bowl design is the one people hear about the most, the mat is also very popular among dog parents. The bowls come in several sizes and colors to allow dogs of all sizes to use them. The mat is one you don't hear about as much, and it's usually a silicone square with a rubber backing that helps it from sliding around. The obstacles are longer protruding parts that can be flexible and the dog food goes around them, so your dog has to hunt for it. You'll get to choose from several different obstacles depending on which type of bowl or mat you choose to buy for your dog. One of the most simple designs is just a simple dome in the center of the bowl that your dog has to maneuver around. They do get more complicated, and you can buy ones with simply raised walls or ridged designs or pillars. The mat type is a flat bottom with long grass-like protruding silicone areas that your dog has to dig through to get to their food. The more heavy-duty choices are generally better for bigger dogs, while smaller dogs may have an easier time with the mat-type bowl. 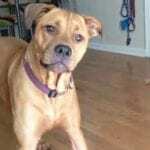 You'll most likely have to experiment to find the best choice for your dog, and this may take time for them to adjust to it. You'll get the choice of three different sizes ranging from extra small to large, and these bowls come in five different colors and designs. It claims to slow your dog's eating down by as much as 10 times, and this can help to ward off bloat or indigestion. It also helps you quickly and easily control your dog's portion sizes, and you can fit up to four cups in a bowl. The different mazes make this bowl easier to clean, and you can rinse it off and drop it onto the top rack of your dishwasher for an effective clean. You'll get a BPA and lead-free product with Outward Hound's bowls, and they all come with a slip-resistant bottom so your dog won't be able to tip it or push it around the floor easily. It's lightweight and weighs in at just over a pound. This heavy-duty plastic bowl has a thicker design and a more simple maze. It has a slightly raised design with four feet for added stability and durability as well. The bottom is coated with a thicker grooved rubber coating that can prevent your dog from moving the bowl around as they eat. Since it has a plastic design, it's resistant to rust as well as bacteria for a healthier and safer food bowl. This particular bowl comes in a shorter medium size, and it holds up to a cup of food at a time. It's also dishwasher safe so that you can pop it in the dishwasher for a quick and easy clean. You can choose from three different sizes ranging from small to jumbo, and they hold between one and six cups respectively. 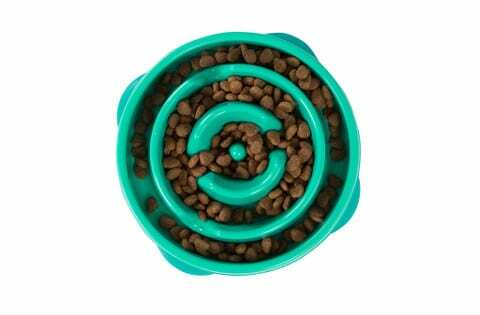 You get three different colors and three different mazes choices with Ootdpet's brand of slow feeder bowls. It holds up to two cups of food, and it's designed to be a one size fits all bowl that's suitable for small to large dogs. The bowl itself is made out of food-safe ABS plastic that is designed to be very durable and chew-resistant. This bowl is designed to help prevent digestive issues and bloat in your dogs which can lead to a healthier and happier dog. The entire bottom of this bowl is covered with a thick slip-resistant rubber coating so your dog can't flip it over when they eat. Cleanup is easy with this bowl because you can rinse it out in the sink and drop it into the dishwasher for a clean and sanitized eating area. This stainless steel bowl comes in three different sizes, and it's metal design means that it'll last for a long time. It has a permanently bonded rubber ring along the bottom that makes it hard to slide along the floor. 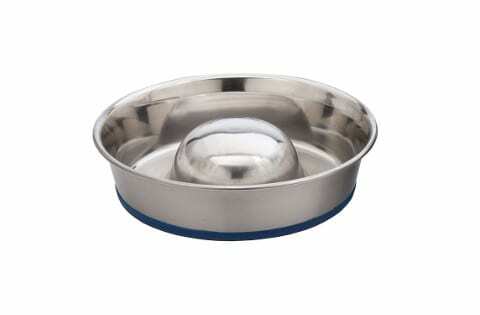 It holds up to three cups of dry dog food, and it has a very simple design with a single dome in the middle of the dish. 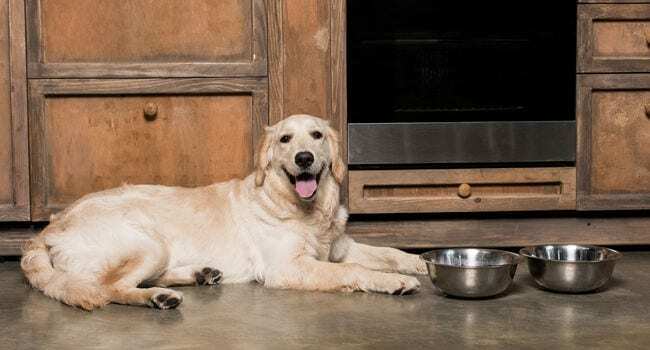 The metal is a more hygienic option, and it is dishwasher-safe so you can clean and sanitize it quickly and easily when your dog finishes eating. This product is made in the USA following strict guidelines and standards, so you know that it's a safe choice for your dog. The edges of the central dome and the edges of the bowl itself feature a rounded design to prevent your dog from hurting themselves when they use it. This bowl is made to be eco-friendly with high-quality plastic that is PVC, BPA, and phthalate free for a healthier bowl. You can choose from two different colors, and the maze design is challenging and interactive so your dog has to slow down. This design lets any amount of food that you put in it go further so your dog will feel full longer with smaller amounts. It lets you quickly and easily control their portions, and this bowl comes with a 100 percent money back guarantee if you're not satisfied with it. The ridges and the edges are rounded, and this makes it a safer choice for your dog because they won't cut themselves when they're trying to get their food out. You can rinse this bowl out under the water and drop it into your dishwasher to clean it. The winner of our roundup of the best slow feed dog bowls is the Outward Hound Fun Feeder Slow Feed Bowl. We chose this product because it comes in several different sizes and with a variety of mazes. It also promises to slow your dog's eating time down by as much as ten times, an this can help to fight digestive problems like bloat. It is BPA and lead-free for a safer material, and you get a slip-resistant bottom so your dog won't be able to push it around the floor. We also liked that it is dishwasher-safe and very easy to clean and maintain.